In 2015 I created a five year plan and now, 2 years later, almost everything in the plan has been realized. The past couple of years have been a time of unimaginable change, adventure, growth, and connections. It wasn’t all rainbows and butterflies, especially early on. I’ve learned quite a bit along the way, and even more important is the ever growing understanding about how the mind works and the world works. Life now is simpler, more full, and is a space of endless possibilities. I can’t begin to imagine what the next few years will bring. Two years ago if you’d have asked me if I could complete the 5 year plan in 2, I’d have said it was impossible. Creating what seems impossible, is within your reach too! Here are 10 tips that will empower you to get to where you want to go much sooner and easier all the while enjoy the journey along the way. Often we say we want things but deep down we don’t. If you don’t want it, you won’t create it. What do you really want? Why is that important to you? Declare it as yours. Whatever it is! Even though the thought ran through my head that parts of the plan were a bit daunting, I had complete faith that each of the milestones and the final state were achievable. This is not the same as positive thinking. This is knowing that it will happen and at the same time realizing you don’t have to know how it is going to happen, just that it will. I knew each of the events on my plan would happen with the same knowingness that I was going to eat dinner, sleep and wake up in the morning. It was done deal in my mind well before it ever was. 3) You don’t have to know how it will happen because the unimaginable happens. Be open. Know that you will know and opportunities will appear- take them. Know that you will have creative ideas in the moment: you will shock yourself, let it happen. So many amazing ideas surfaced and events occurred that I never could have planned. Expect the same. You will know how. Be open and go with it. This is huge: Start the journey! Take a small step. Notice what comes up. Take another step. Notice again. Imagine taking a walk up a trail you’ve never been on before. It has twist and turns and forks in the road but the paths all lead to the top of the mountain. What might you do? I’ve found this is what works best: Start the walk, respond to what comes up and continue taking that next step, and the next, and the next. It all starts with that first step and from there be open to what comes up, trust, and continue moving up the path. I knew the truck I wanted to pull my future home and planned to purchase it in 2019, but it showed up in 2016… the exact truck showed up! In fact, the truck that appeared had more bells and whistles than I hoped for. It was in pristine condition and almost half the price of new. It was in Ohio, I was in Florida. The for-sale ad was in an email I normally wouldn’t open, but I did. I only called the seller because I was curious what a used truck in that condition went for. Everything seemed too good to be true. I had a knowingness that led me to buy a one-way ticket to Cleveland within days. It wasn’t too good to be true, it was better than I could have imagined! I trusted my intuition and it was right. Many people have heard stories about how things have seemingly fallen in my lap and say “you are so lucky.” I think we all create our own luck. Take your next step, be open, trust and create your own luck too. So many ideas have popped up seemingly out of nowhere and so many of my decisions have been purely based on gut feeling. We all have access to the same inner wisdom and innate creativity. When we are in a state of wellbeing creativity flows and we are resourceful, wise, and resilient. On the other hand, when we think the outside world effects how we feel our thinking gets contaminated: We may feel stress, pressure, worry, anxiety… and we think the world is causing those feelings. This is when our creativity gets stifled, our resiliency is suppressed, and our intuition is muddled. Know that our natural state is one of wellbeing and when you reside there, anything is possible. Be there, listen for the whisper and trust your intuition. So much focus is placed on attaining goals. Enjoy today and every day. How might things change when you thoroughly enjoy each small part of the process? Give the process everything you can and every day is a blast! It doesn’t have to be hard. It has taken me 38 years to learn this lesson and I am still in the midst of the learning. Love people, be open, do what lights you up, and learn to love the things that don’t seem fun– it’s A LOT more fun that way. I always thought of myself as shy, was very timid in crowds and avoided parties and gatherings. If I was forced to go to a large gathering I was the one with my back to the wall people watching and hoping no one came by to small talk. I felt like crowds sucked the life out of me. To start and run a business I heard it was best to get out and talk to people. I hated it. I thought I was not good at it and it seemed like self-induced torture. When I tell people that now: their jaws drop because two years later I am a conversation queen. I love mingling and chatting with people anywhere- it fires me up. My thoughts about gatherings and mingling changed and that changed everything. We can learn to love anything- then it becomes easy and fun. Give it a try. I have been climbing Mount Everest the past two years and could not have done it without my Sherpas and help at home. 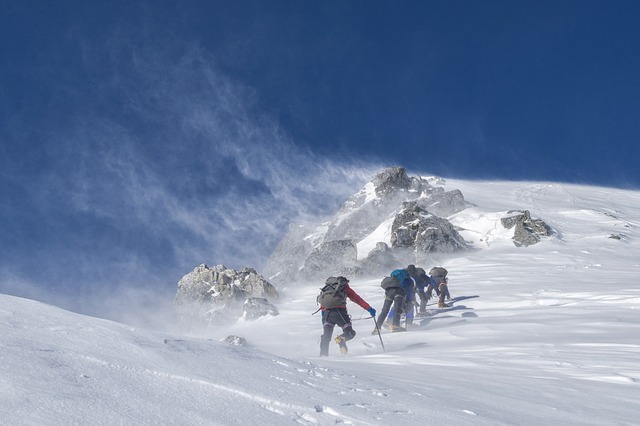 We all need Sherpas (guides and mentors). Get a guide- a coach that loves and supports you, someone who notices where you are getting in your own way and is able to constructively help you see new ways of being in the world. This person must know that there are unlimited possibilities in you and be willing push you to see new things, explore places you’ve never been before, and encourage you to be all that you can be. Having help at home also made all the difference in the world. Jim took over all the household duties, made sure I was fed, watered, and had plenty of energy create and coach. This has truly been a team effort. The first 9 tips provide for the ultimate experience in creating your amazing future. You are heading in the direction of your dreams and you have all that you need to be happy and successful: continuous forward momentum is all that is left. Take a step and the next step will reveal itself… and repeat. By no means am I saying “I followed these 10 tips and the entire trek was easy.” I didn’t always do these things, especial early on. Here is what I did do from the get go: I claimed it, I was stubborn as heck, and I kept taking steps. I learned so much along the path. There were many times I put on a fake smile, I cried into my pillow, and I thought there was no hope. But I rarely do that now. Your path will be different: it will be your own. I encourage you to take the journey, whatever it might be. Do this and your world will change, then the world around you will change, and the ripple effect will be infinite. What might be your next step? Consider finding your Sherpa and starting your climb. It’s an amazing adventure and the views along the path are breathtaking. I am still heading towards the summit and that is just the place to be… this adventure is amazing and I hope it never ends. Copyright 1998 - 2018 Visioneers. All rights reserved.